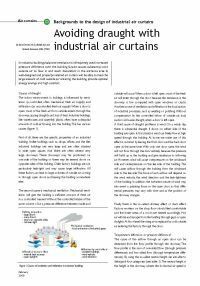 In industrial buildings balanced ventilation is infrequently used. Increased pressure difference over the building facade causes substantial cold outside air to flow in and much discomfort in the entrance area. A well-designed and properly installed air curtain will be able, to heat the large amount of cold outside air entering the building, provide optimal energy savings and high comfort.